Our plant-rich conditioner protects and feeds your hair. It moisturises the hair well, making the hair shiny and easier to comb. This earth friendly conditioner contains no nasty ingredients to clog up pores in the scalps. 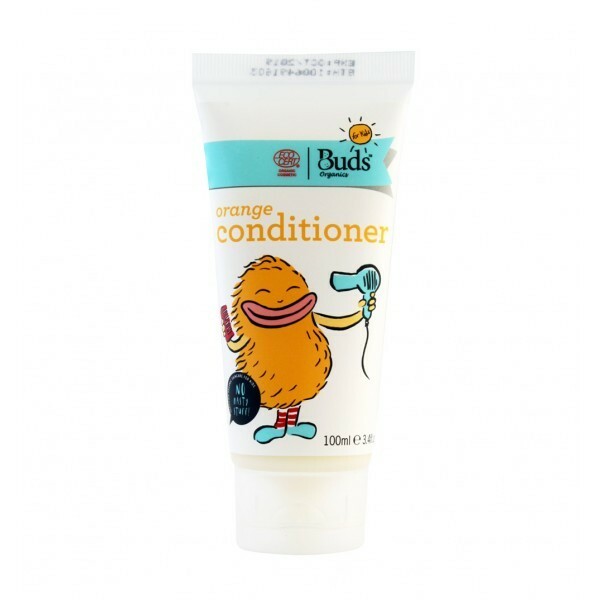 Our planet and kid friendly include ingredients Shea Butter, Sunflower and Jojoba oils to make your hair strong and shiny, and Orange which smells fresh and makes you feel calm and cheerful. Aqua/water, aloe barbadensis leaf juice*, simmondsia chinensis (jojoba) oil*, cetearyl olivate, sorbitan olivate, butyrospermum parkii (shea butter) fruit*, PCA glycenyl oleate, xanthan gum, tocopherol, helianthus annuus (sunﬂower) seed oil, citrus dulcis (sweet orange ) oil*, sodium benzoate, potassium sorbate. For the best start in life, Organically! Buds Organics is your chance to nurture and care for baby’s skin, and your own, with the world’s largest line of certified organic baby and mother care products. Their products are packed with wonderful natural and organic actives and completely free of animal testing.